BURTON, Theodore Elijah, a Representative and a Senator from Ohio; born in Jefferson, Ashtabula County, Ohio, December 20, 1851; attended the public schools, Grand River Institute, Austinburg, Ohio, and Iowa College, Grinnell, Iowa; graduated from Oberlin (Ohio) College in 1872; studied law; was admitted to the bar in 1875 and commenced practice in Cleveland, Ohio; elected as a Republican to the Fifty-first Congress (March 4, 1889-March 3, 1891); unsuccessful candidate for reelection in 1890; declined to be a candidate for the Republican nomination to Congress in 1892; elected to the Fifty-fourth and to the seven succeeding Congresses and served from March 4, 1895, until his resignation, effective March 3, 1909, having been elected United States Senator; chairman, Committee on Rivers and Harbors (Fifty-sixth through Sixtieth Congresses); chosen a member of the American group of the Interparliamentary Union in 1904; appointed by President Theodore Roosevelt as chairman of the Inland Waterways Commission 1907-1908 and of the National Waterways Commission 1908-1912; member of the National Monetary Commission 1908-1912; elected as a Republican to the United States Senate and served from March 4, 1909, to March 3, 1915; was not a candidate for renomination in 1914; chairman, Committee on Expenditures in the Treasury Department (Sixty-first and Sixty-second Congresses); engaged in banking in New York City; elected as a Republican to the Sixty-seventh and to the three succeeding Congresses and served from March 4, 1921, until his resignation on December 15, 1928; did not seek renomination, having become a candidate for Senator; appointed by President Warren Harding as a member of the World War Debt Funding Commission in 1922; chairman of the United States delegation to the conference for the control of international traffic in arms at Geneva, Switzerland, in 1925; elected on November 6, 1928, as a Republican to the United States Senate to fill the vacancy caused by the death of Frank B. Willis and served from December 15, 1928, until his death in Washington, D.C., October 28, 1929; funeral services were held in the Chamber of the United States Senate; interment in Lake View Cemetery, Cleveland, Ohio. Papers: 1920, 1928. 6 items. Concern Ohio and Cincinnati politics. Papers: Correspondence in Lyman Bronson Hall papers, 1871-1918. Finding aid. Papers: Correspondence in Lewis Cass Laylin papers, 1897-1923; Maurice Maschke papers, 1924-1936; William H. Phipps papers, 1890-1913; and Frank Bartlette Willis papers, 1892-1928. Finding aid. Papers: In the Nelson W. Aldrich papers, 1879-1915, on 63 microfilm reels. Originals at the Library of Congress. Papers: 1870-1958. 155 boxes, 41 volumes, and 3 oversized packages. Congressional, political, business, and personal correspondence, diaries, speeches, notebooks, travel journals, scrapbooks, campaign material, memorabilia, and a statue. Includes material on the 1924 Republican National Convention and the 1928 Ohio primary election, his books Financial Crises and Periods of Industrial Depression (1902) and John Sherman (1908), and galley proofs of his biographer, Forrest Crissey. The papers document his interest in waterways and conservation, advocacy of building of the Panama Canal, service on National Monetary Commission, activities in foreign affairs issues from the Spanish American War, arbitration and disarmament, Canadian reciprocity agreement, tariff controversies, and the Ohio floods of 1913 and proposals for flood control. Finding aid. Additional Papers: In American Peace Society, Cleveland Branch, records, 1913-1919; Alcinus Ward Fenton papers, 1862-1912; Orlando John Hodge papers, 1822-1913; and James Humphrey Hoyt papers, 1894-1896. Papers: In Carrington family papers, 1749-1929. Burton, Theodore Elijah. Financial Crises and Periods of Industrial and Commercial Depression. 1902. Reprint. Freeport, NY: Books for Libraries Press, 1971. ___. John Sherman. 1906. Reprint. New York: AMS Press, 1972. ___. Modern Political Tendencies and the Effect of the War Thereon. Princeton: Princeton University Press, 1919. Crissey, Forrest. 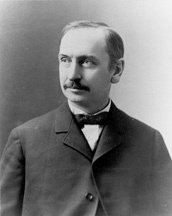 Theodore E. Burton, American Statesman. Cleveland: World Publishing Co., 1956. Stay, Clarence Reuben. "Theodore E. Burton on Navigation and Conservation: His Role as Chairman of the Committee on Rivers and Harbors, 1898-1909." Ph.D. dissertation, Case Western Reserve University, 1975.